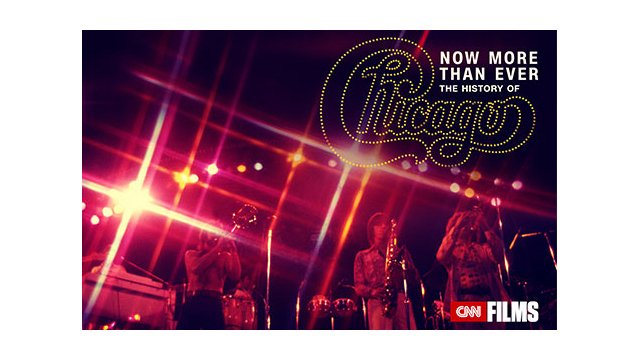 CNN Films will premiere Now More Than Ever: The History of Chicago, about the rock supergroup, on Sunday, Jan. 1 at 8:00pm and 10:00pm Eastern on CNN/U.S., the network announced today. The film’s debut presentation will be offered with limited commercial interruption. In 2017, the band will mark 50 years of pop music success that includes 36 albums, yearly tours, induction into the Rock and Roll Hall of Fame in April 2016, two Grammy® award wins (including one for the band’s first album, Chicago Transit Authority, for the Grammy® Hall of Fame in 2014), 21 Top 10 singles, five consecutive No. 1 albums, an incredible 25 certified platinum albums, multiple American Music Awards, and more. Band founders Robert Lamm (keyboards and vocals), Lee Loughnane (trumpet and vocals), James Pankow (trombone), and Walt Parazaider (woodwinds) remain from the original crew, making Chicago America’s rock band with the most longevity in history. Now More Than Ever was directed and edited by Peter Pardini. Pardini’s unique access yields deeply personal reflections the band’s origins, successes, and struggles. Pardini weaves archival and contemporary interviews, footage from the band’s DePaul University college days and tours, and contemporary interviews with band members and managers through the years to reveal Chicago’s chart-topping, pop culture iconic history through intimate layers. Bandmates discuss their early days of peace rallies with Janis Joplin and Jimi Hendrix, as well as the stories behind their hit, 1969’s ‘Does Anyone Really Know What Time It Is?,’ to ‘If You Leave Me Now,’ to ‘You’re The Inspiration,’ and many more with colorful insights into how the band members were growing as people, and sometimes feuding, as artists and bandmates. Throughout, Pardini’s deeply personal interviews tell the backstories to ‘Just You ‘N Me,’ which was written by Pankow, following an argument with his fiancée, and ‘Hard to Say I’m Sorry,’ which introduced Chicago to a whole new generation of fans as well as some new creative tensions, when the song became part of the soundtrack to 1982’s Hollywood romantic comedy, Summer Lovers. And, movingly, Pardini examines the band’s wild years while living and recording at Caribou Ranch, and the devastating and emotional loss of gifted lead guitarist Terry Kath, to an accidental self-inflicted gunshot. In addition to the premiere broadcast, NOW MORE THAN EVER: The History of Chicago, will also stream live for subscribers via CNNgo beginning Jan. 1 (at www.CNN.com/go and via CNNgo apps for AppleTV, Roku, Amazon Fire, and iPad). The film will also be available the day after the premiere (Monday, Jan. 02) on demand via cable/satellite systems and CNNgo. NOW MORE THAN EVER will also encore on CNN/U.S. on Saturday, Jan. 07 at 8:00pm and 10:00pm Eastern. CNN will explore the band’s incredible music legacy through the experiences and reflections of their superfans in interactive pieces for CNN.com. Video excerpts from the film, and photographs from Chicago’s tours, will also be available via CNN’s mobile platforms and online at www.CNN.com/history-of-chicago closer to the time of the broadcast premiere. Viewers can interact with CNN Films about NOW MORE THAN EVER by using the hashtag #HistoryOfChicago via Twitter before and during the premiere. CNN Films, celebrating its fifth year in 2017, produces and acquires documentary feature and short films for theatrical and festival exhibition and distribution across CNN’s multiple platforms. Amy Entelis, executive vice president of talent and content development, oversees the strategy for CNN Films; Courtney Sexton, vice president for content development, works day-to-day with filmmakers to oversee projects. For more information about CNN Films, please visit www.CNN.com/CNNFilms and follow @CNNFilms via Twitter. CNN Worldwide is a portfolio of two dozen news and information services across cable, satellite, radio, wireless devices and the Internet in more than 200 countries and territories worldwide. Domestically, CNN reaches more individuals on television, the web and mobile devices than any other cable TV news organization in the United States. Internationally, CNN is the most widely distributed news channel reaching more than 320 million households abroad; and CNN Digital is a top network for online news, mobile news, and social media. Additionally, CNN Newsource is the world’s most extensively utilized news service partnering with hundreds of local and international news organizations around the world. CNN is division of Turner Broadcasting System, Inc., a Time Warner Company.